January | 2010 | Through the seasons before us..
Can’t have many complaints really. Derby worked hard and didn’t let us play, an unattractive game from both sides with the Rams creating the better chances. Raddy made a mess of a great chance he’d created, and Bywater made an excellent double save – but the rest if the chances of note came for the home side. Hulse was quite lucky to not have picked up a second yellow, but we know only too well he can be in an aerial bombardment! Pisser to lose our unbeaten runs to them, but it gives any complacency a kick up the arse, and gives Billy ammunition to pressure the panel to get a left-back in. Perchy struggled today out of position. Derby fans get the bragging rights, but we stay second. Will update properly later in the week – this is from my phone in a service station! Chin up, Reds fans! Just to get you in the mood..
Derby County vs. Forest preview.. In case you hadn’t realised, we’ve a football match on Saturday. Whilst it may not get much national recognition, games between these two sides are generally passionate affairs – and I’m really looking forward to it. Pride Park of course hasn’t been a remotely happy hunting ground for the Reds, never registering a win since the Rams moved house to an industrial estate. Form would suggest that this could be an excellent chance to remedy this. The cliche to dig out for any ‘derby’ game is that the form book counts for nothing. The Reds go in to this with the opportunity of extending their unbeaten league run to twenty games – the Rams prepared midweek by travelling to Plymouth and losing. They’ve won one league game in six, and lost the last three league games at Pride Park. They have, however had a couple of decent cup results at home – a win against Millwall (on penalties) in their replay, and beating Doncaster 1-0. Agent Clough has been on a well-publicised purge of the wage bill at Derby, and rumours abound that they will listen to offers for their players – with Hulse linked to clearly-in-need-of-a-striker Queens Park Rangers. Given our own links with extending Shorey’s loan (although he made the Villa bench tonight) and bids for Victor Moses – we too might have unexpected players available for inclusion. As might the Rams – who are scouring the loan market to strengthen their squad. Tuesday night’s game saw Wes pick up an injury, aside from that we’re in good shape – with Chambers waiting in the wings should he be needed. I would expect to see Moussi return to midfield to give us strength in the middle probably at the expense of Earnie, leaving Dex up front. The left-back berth will depend on whether Shorey’s services are reacquired – if not then Perchy will be keen to deputise again as he did to impressive effect against QPR. Our hosts are likely to feature everyone’s favourite pantomime villain, Robbie Savage – who seems to be the first name on Clough’s teamsheet. It will be interesting to see if he uses the game as an opportunity to try to get something out of a certain chubby winger who used to play for us. The reports I hear from the Derby fans I know suggest that something Derby have lacked of late is wideplay, Clough opting to pack the midfield with central midfielders. Billy Davies will, of course, have a much keener idea about our opponents than I – and will have prepared his team and tactics accordingly. With Newcastle picking up an expected victory over troubled Crystal Palace this evening, we could temporarily occupy top-spot with a win of 3-0 or better. Frankly, a scrappy 1-0 would be plenty for me and the other Forest fans lucky enough to avail themselves of a ticket. That natural level of pessimism that only a football fan can have kicks in for me though (makes a change, huh? )… given the pressures Derby are under this game represents a massive opportunity for Agent Clough reduce some of the flak coming his way. Aside from the (I think unlikely) risk of being sucked into a relegation scrap, this really does represent probably one of the few things Derby have left to play for this season. On a more self-indulgent note, you’ll have to wait a bit (potentially a few days) for post-match reaction as I’m hot-footing it to the wilds of Scotland straight after the game (having already incurred the wrath of family members for joining them later – who organises such shindigs during football season!?) so will have limited if any connectivity. I might get a chance to post something at some point, or maybe not – but don’t worry (as if you would!) my absence is definitely planned! What a great warm up for Saturday’s visit to a certain place. The Reds took a wee while to warm up, but each graduation from first to second gear left our hapless visitors flailing as Forest helped themselves to goals galore seemingly whenever they felt like it. With the crowd clearly already thinking about the weekend, it took them and the team a while to get going – but well, the scoreline says it all, and we didn’t look like we were trying! QPR of course arrived under a caretaker manager – Mick Harford is remembered mostly fondly for his time at Forest, I seem to recall we might’ve beaten QPR with him in temporary charge of us. They’d just sold Routledge to Newcastle, and look as out-of-sorts as you would expect really. Perhaps more so. I couldn’t help but feel for the Hoops fans nestled at the back of the away end with very little recourse for joy as Forest fans lapped up a very comfortable win. It was great to see QPR old boys Camp and Dex get a good reception from the QPR fans before the game. After making us swap ends it became apparent that Billy was asking Perch to slot into left back rather than Gunter, and it was Perch who provided the first chance for Blackstock – Raddy had found Perch out on the left and the Newcastle target put a decent cross in towards the Reds striker, who was beaten to the ball by Connolly on this occasion. As fans were chanting about the forthcoming Derby match there was a worry in me that the players too might have half a thought on that game. It was a bit of a needless concern, as it transpired – a freekick central just out the D was given after Blackstock was fouled. As Ikeme set his wall up and took his stance I said to my neighbour that an Earnie right-footed chip to the right top corner would prevail – he was convinced it would be a Cohen left footer – I was right, and was suitably smug about it – a delightful finish from Earnie. And it was only a mere two minutes before we’d doubled the lead – Anderson burst through from the half way line on the left cutting in, and played a cracking pass across to Earnshaw putting him clear down the right channel. He made no mistake from around 12 yards slotting the ball firmly past Ikeme into the net with ease. The QPR ‘keeper had a chance to make a first save shortly after when Raddy unleashed a powerful drive from range. Lee Camp had his first activity of the game after this – Taarabt had a tame effort from the edge of the box which he was able to catch with ease. Then it was business as usual – Earnie was found in the box and was unceremoniously bundled over by Gorkss with the referee not hesitating to award the spotkick. Both Dex and Earnie went for the ball – but Earnie’s wasteful previous use of penalty kicks meant that the former-QPR man ended up taking it. No problem for him either – sending Ikeme the wrong way as he put the ball powerfully into the bottom-left corner before celebrating infront of the Trend End. So just after half an hour gone, three-nil up – to be frank, it was understandable that the pace would drop. Forest kept the ball, and QPR didn’t really try too hard to get it back. We joked in the stands that it wasn’t the same coming to Forest without anything to moan about, it’s remarkable the transformation in such a short space of time. So, second half – QPR came out promptly and it seemed to take ages for Forest to arrive on the pitch. Despite either this mistiming or mindgames, the visitors started the half reasonably positively – they picked up a freekick in a similar position to that which Earnie had scored from in the first half, Taarabt took it square to Quashie whose shot was decent and on target, but not particularly challenging for Camp who dived to his left and saved. There was a sucker-punch though – Forest started to build possession and get forward again, Perch found Cohen who seemed surprised to find himself unmarked. His shot from 25 yards looked like the keeper should save it from my seat, he got a hand or two on it – but it was powerful enough to still find the back of the net to give Forest a four goal cushion. Similar to the Leicester game earlier in the season, with the visitors down-and-out they actually started to knock the ball around quite well. Their best opportunity came shortly after this – some neat passing ended up with a cross coming in from the left, Camp was only able to punch away not particularly convincingly – and eventually Connolly had an effort on goal that the Reds ‘keeper was only able to Parry to Buzsaki – who blazed into the Trent End with – whilst not exactly an open goal – a chance that he really should have at least got on target. Taarabt had another shot shortly after, with Camp saving at the expense of a corner. The fifth goal perhaps should have come from Forest’s next break – Earnie pushed the ball into the left channel for Anderson to run on to, but the winger didn’t make use of the time and space he had and seemed to get caught in two minds, ending up dragging a cross/shot wide of the goal but not quite close enough to the onrushing strikers – with Earnie grinning but looking frustrated at being denied a chance of a hattrick. Immediately after this Majewski threaded a nice ball through to the oft-overlapping Perchy,who’d made a good run into the box but his shot/pass was blocked for a corner. From this corner Dex got a header on it which was going wide near the back stick, where Earnie was lurking and his header looped – but just over. At this point I suspect he might’ve been resigned to not picking up that elusive third goal! Anderson was withdrawn for Tyson at this point to great applause, and almost immediately after Wes was withdrawn to a great ovation – replaced by Chambers. Worryingly Wes seemed to be limping slightly, but hopefully it was a precautionary withdrawal. The changes didn’t seem to change Forest’s intent – Dex sent Tyson into the box, with Quashie in close attendance – indeed, Tys should perhaps have not been so honest, as the former Reds midfielder was all over him. He did get a cross in, but it was cleared. The fifth goal came with more ‘Keystone Cop’ defending from the visitors – the Reds had three attempts to get this in – after Perch did well to burst into the box and play it across the six yard box, Cohen had the first effort which was cleared off the line, it fell for Earnie who miskicked horribly before Perchy was in the right place to hit it goalward with his left peg – it was deflected, and provided us with the goal! Dexter was attempted to be subbed straight after the goal, but the ref lost patience and we had to wait ’til the second half was underway for the change – with Dele coming on, and the referee escorting the grumpy-looking Dex off the pitch (as he had with Anderson) as presumably he was concerned they were taking a little while. He was quick to hurry along the goal celebrations too – I don’t think QPR were too bothered about any additional time, in all honesty! The Reds continued to keep an easy level of pressure on the visitors – Tys did well to beat Ramage for pace and put in a cross towards Adebola but the chance was cleared. The game ended with QPR on the attack, but Cohen was on hand to clear to ensure the clean sheet was kept intact. One more goal and we’d have (probably temporarily) supplanted Newcastle at the top of the league – we find ourselves level on points with the Geordies but they have two games in hand, starting tomorrow night with in-administration Crystal Palace. More gratifyingly we are now five points ahead of West Bromwich Albion in third – with the Baggies just having one game in hand. If you look down to seventh then the gap is thirteen points. All the teams in the promotion mix have at least one game in hand over us though – with the exception of Swansea. Our goal difference is now joint second best in the league – just one behind Newcastle. On fifty-two points, we are all but safe from relegation (that said, Leicester were relegated the season before last with that many – so we’ll have to win on Saturday to ensure safety!). All in all, what can you say, except for BRING ON THE DERBY! Rumours broke yesterday that Newcastle had made an offer for the versatile James Perch. Today Forest confirmed that was indeed the case, that the offer was derisory and had been rejected – and that James Perch is not for sale, particularly not to a promotion rival. They have made an offer for James, but it is a derisory offer and the bottom like is that he is not for sale anyway. We are not interested in selling James at any price, particularly not to one of our rivals in the Championship. As I said, the offer was derisory, but it doesn’t matter because he is not somebody we want to sell. We do not want to sell any of our players. We want to strengthen our squad, not weaken it. James has not featured very much this season, but that is purely because he has been injured and, during the time he has been out, I have said all along that we have missed him. He is a vital member of this squad. I guess we have got a few people worried. This is good news for me – Perchy is oft maligned by Forest fans but I’ve always appreciated his workrate and tenacity. His ability to put a tackle in is second to none in our team, in my opinion, and with some work on his passing and decision-making he could continue to develop into a better player. It is also reassuring that the current league leaders are bidding for a player who – even if fit – would be far from guaranteed a starting place in our team given the myriad of options we have open to us. Given Billy’s proclavity to play Gunter over at left back and Perch at right back when required, that might be needed sooner rather than later. Still to your guns Forest, and don’t sell to Newcastle. The BBC’s new regional coverage of the Football League is, in my opinion, the very format The Football League Show at weekends should be. Less of the aimless wandering around a late night office, and very much like the Match of the Day 2 format. I think the industry call it more of a ‘magazine’ show – whatever that means. The presenter, Manish Bhasin, talks more about it in The Evening Post here, and comes across very well I thought – it must grate having to smile as you describe your team being annihilated 5-1 by a hated rival! 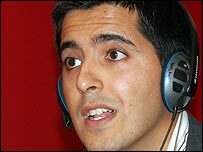 Either way, it means that Manish Bhasin – who despite his Leicester-affiliations is a decent presenter – gets to sit down on a settee with panelists who vary. Whilst Steve Claridge is very knowledgable, there isn’t much charisma there – a bit of variety would be nice. Even the cartoon villain Robbie Savage being present wasn’t too much of a problem, a sly ‘Notts Forest’ was more than made up for by Bhasin forcing him into admitting Forest were ‘fantastic’ and surely ‘deserved favourites for promotion’. That must’ve been horrible. It does rather make you question the conflict of interests in a current player punditing, but then Billy Davies was a guest of Sky for Newcastle’s game against West Brom – and came across very well I thought. The game worked out well too, personally I didn’t think any result on the night would be without advantages for us – but perhaps both sides dropping points is preferable from our position in between them. West Brom can recapture second with a win over Blackpool in their game in hand, but only on goal difference. Back to ‘Late Kick Off’ – it worked well for me, features and interviews – even though Forest weren’t featured – were interesting, and it was great to see how many mentions we got spontaneously despite not being a featured team! The proof of the pudding will be in next weeks show – I saw the dreaded email address and text number advertised, please don’t ruin what promises to be excellent regional football coverage with a godawful “and now, over to Lizzie with your emails and texts!” feature. Those of you who missed it, or are in the UK but not the midlands, you can catch up with BBC’s iPlayer. For those ex-Pats or Reds from far and wide out there, I’m afraid you’ll need to have a scout about for torrents or similar.